Country fans, are you hyped for this EPIC show?? 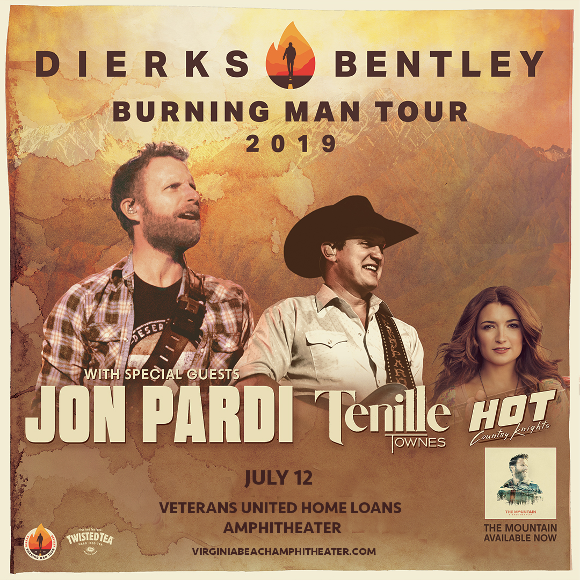 That’s right, Dierks Bentley is hitting the road again in 2019 with the Burning Man Tour, with special support from Jon Pardi and Tenille Townes!! They’re headed to the Veterans United Home Loans Amphitheater on Friday 12th July 2019 for a country music extravaganza that no fan is going to want to miss it!! Make sure that’s not you – book your space at the show by hitting the “Buy Tickets,” button above NOW!! We’re super excited to see it all live – are you?? Make sure you don’t miss it, especially if you didn’t get the chance to catch Dierks Bentley last year. But hurry – if that tour was anything to go by, tickets will sell out quick! !